One of the great things about traveling abroad is trying the local cuisine and exposing oneself to different flavors and textures that come with it. Being in a place like Japan, you also can’t help but try stuff that’s local to you but exotic to the natives. To get their spin on it. This brings me to Nestlé’s Kit Kat bar. Japanese Kit-Kat commercial from Oyastucafe’s Youtube page. 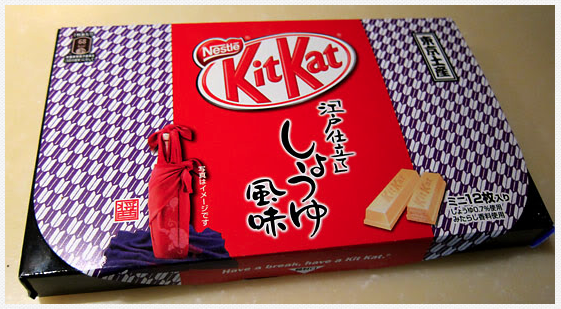 During my first trip to Japan, I couldn’t help but notice there were KitKat bars all over the place AND they were almost any flavor but traditional chocolate. I’m not big on sweets but curiosity got the better of us and we tried the Apple, Green Tea, Blueberry, Sweet Potato, Cheesecake and braved the soy sauce flavored one. It’s not what you think (wasn’t salty at all) but not at the top of my list. We liked the Cheesecake and Green Tea flavors a lot, actually. Nestlé will probably never actively market them in the US because of general American consumer conservatism. I mean corn flavor? Really? Compared to American cuisine, the Japanese live more on the edge with their ingredient selections; their food culture is awesomely insane! Really not bad at all, actually. …as well as the corn flavor. Still, you can probably find some stuff on ebay if you look hard enough. These confections are great conversation starters and could give your taste buds a little adventure. You only live once right? Maybe I should work for Nestlé…? Flavors from a Kit-kat collector’s (hungrycurioscat) blog. I’ve seen people (online) collecting every flavor they can get their hands on, including special edition or limited runs. Again, I’m not really into desserts and sweets but the idea finding a new flavor when I return to Japan is kind of exciting. Author hikikomori78Posted on June 30, 2013 June 13, 2013 Categories Japan, UncategorizedTags Cheesecake, Green Tea, Japan, Japanese Cuisine, Kit Kat, Nestlé11 Comments on Over 200 Flavors of Kit Kat in Japan. Who Knew? 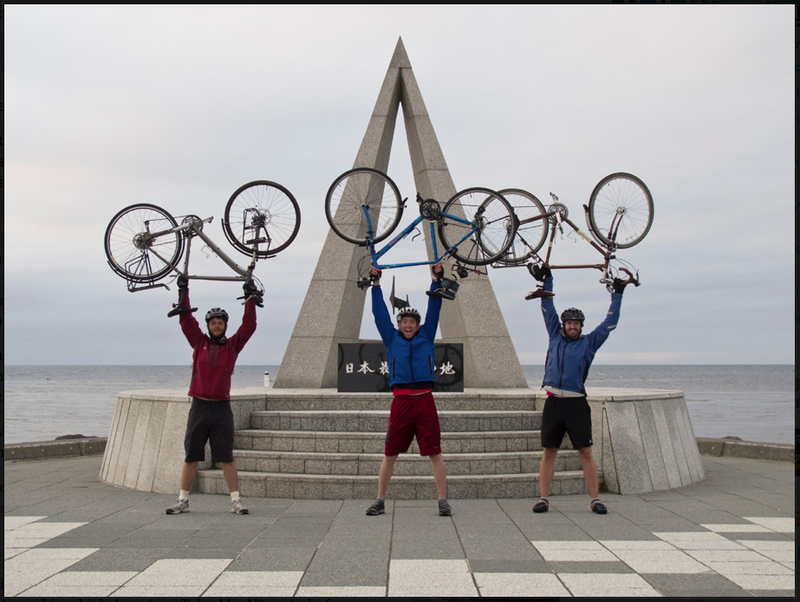 I just watched a video documenting three gaijin bicyclist riding across Japan from the most southern point (Cape Sata) to the most northern point (Cape Soya). They also did this not long after 3/11. However, watching it you wouldn’t know it. 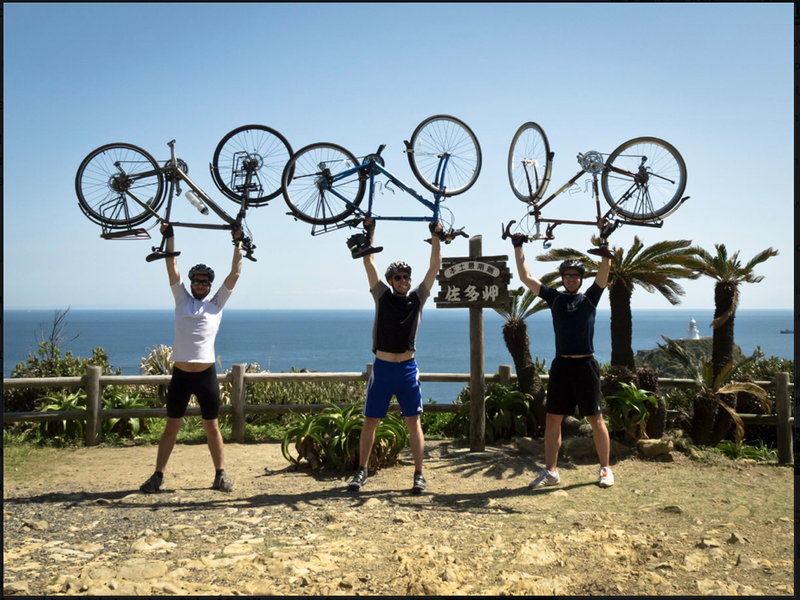 You can watch it here on Andrew Marston’s website and can also get more info about the trip with additional media to help you plan your own journey. Andrew, Scott, and Dylan’s journey across Japan is beautifully recorded and edited in a way that this video comes across more as a friend’s home video montage than a straight documentary and I’m good with that. They hit some spots I’ve been to (in Kyoto) and others that are still on my list (Nagasaki/Hiroshima). I get excited when I see people in exact places I’ve visited and curious about others I may have missed or have yet to cross off my list. It’s a casual video and you can watch it for free. If it doesn’t inspire you to visit another country, then I’ve wasted both of our time. I found a short doc. I found this, like everything else, during my attempts in researching my film. It has nothing to do with Hikikomori but does give some perspective (one man’s perspective) on what it’s like to live as a Japanese citizen. Parents, there is strong language. This short doc is quirky but interesting in it’s unbarred exposure of these people’s lives in Yamagata. Speaking from experience, it can weeks if not months to gain this level of trust and brutal (when not belligerent) honesty. Also, nattō is fermented, not rotting. Nattō: It’s good for you but smells horrible. It’s the one thing my wife and I don’t eat. Her friends love it. I think it’s a great piece about small town life but not the only story. Black in Japan: Not What You Assume. 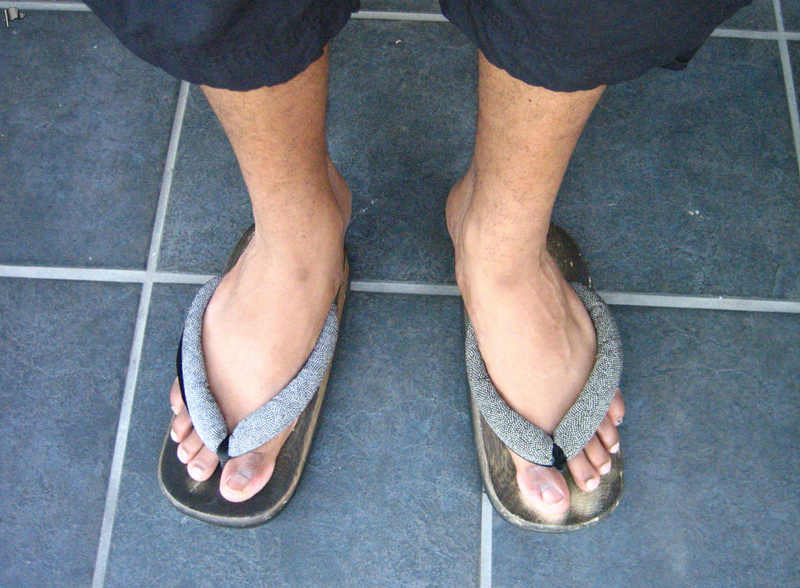 Yes, I put a picture of my feet (in Japan) on this blog. So as I continue on my journey to make an independent short film about a Hikikomori in the US, I find myself also becoming more like one in order to get these blogs out. My entry, “The ‘D’ Word” touched a soft spot but how about some personal accounts? This video completely blew me away. If I can ever speak 日本語 half as skilled as Kemushichan, I would be a very happy man and so would my wife. (Conversations with the in-laws get frustrating for me real fast.) I’m re-inspired to improve my 日本語. Ms. Scott’s youtube page is all about helping you learn Japanese and her experiences in Japan. If her series is anything like this video, you’re in for a good time. She’s got great energy and you can tell she’s passionate. For more about her and what she’s really trying to do go to her website. So after that I had to look up Rhyming Gaijin to see who Kemushichan was talking about. His video (below) wasn’t so much a response but a pitch (similar to ABC’s What would you do?) It should be also noted that both these videos were presented and showcased (in 2011) by Gimmeaflakeman. Victor and Tomoko Sensei do some fun and informative stuff. I also agree with Victor that there will never be a satisfactory answer. (The question being: How do Japanese view “black” people?) And Rhymin Gaijin’s attempt may fall on deaf ears but that’s the purpose of vlogging. Whoever listens, great. Whoever doesn’t, whatever. I believe Rhymin Gaijin believes (as I do, and my wife) that we should be proud of our culture and heritage BUT we have to look at ourselves as people, first. Not a color. If we continue to allow ourselves to be labeled as a color and not a person, how will we ever get past this whole race issue? Before I met my in-laws, my wife told me that her family looks at my (American) nationality first, then my personality/intelligence. So far they’re all on board but I had to earn it. Grandma and grandpa took a little longer but for obvious reasons (they come from a different generation of thinking). I really appreciate Victor’s attempt at going to the source and completely respect his effort in tackling this issue. I do agree that if you want to know what Rhymin Gaijin’s experiences are like check out his youtube page he put a lot of it there. People who are curious should check it out but you’re not going to know for yourself until you go. Everyone’s experiences will be different, just as Victor and Sec1productions say… after Victor’s bad hair day. Out of the three, this video was my favorite. For the record, I met and dated my wife in the states. The longest I’ve ever been in Japan (to date) has been a little less than a month. I work in the film / television industry, so Los Angeles is the best choice for me and my wife has chosen to stay with me. Our reasons for not living in Japan have more so to do with an individualistic society vs. a collectivistic society. Not race. As a matter of fact, her treatment as a foreigner by Americans is what inspired our film. During a visit, when we’ve gone on roadtrips to more rural towns, people look. Some stare. A few try to strike up conversation but overall I haven’t had any problems (as a visitor). What is a problem are the way some US enlisted men and other foreigners decide to commit crimes or a nuisance that gives every foreigner a bad rap. It’s embarrassing as a visitor and insulting as an American when our own can’t behave or are disrespectful. Author hikikomori78Posted on June 9, 2013 June 9, 2013 Categories Film, Hikikomori, Japan, UncategorizedTags black in japan, hikikomori, Hollywood, Japan, life in japan, loneliness movie, racism1 Comment on Black in Japan: Not What You Assume. 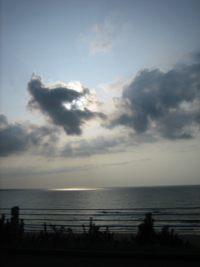 During my first trip to Japan I went on a road-trip with my new in-laws and we wound up on the Northwest side of Honshu and I saw the Sea of Japan. For some reason I slowly gained a feeling of peace with an underlying sadness I couldn’t shake. For me, some places just have a an aura of sadness despite their beauty. It was the same for me when I visited New York’s twin towers site, Gettysburg, Pennsylvania and Salem, Massachusetts. However I have no problems with hospitals, funeral homes, or most cemeteries. When I stumbled on this video about a “Suicide Forest” in Japan, I wondered how overwhelming this place must be to visit. Just to be clear, I have no plans or intentions of going (if I want to make myself depressed, I only need to look at my bank account) and people (mainly foreigners) visiting in hopes of seeing dead bodies are ghouls. So why did I show you this? I think the point the small sign is trying to make is spot on although people who’ve made up their mind aren’t going to be that easily deterred. For me, there is also a small degree of morbid curiosity but it only goes as far as Azusa Hayano’s question: Why would someone want to commit suicide in a beautiful forest? With all the chaos that can complicate our daily lives, maybe the question alone answers itself.